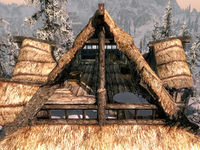 Traitor's Post is a crumbling shack and bandit outpost east of Windhelm, and just north of the Sacellum of Boethiah. 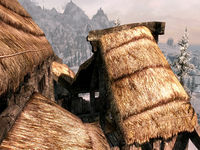 It is easily found by taking the road northeast from Windhelm towards the border with Morrowind. Once past the three farms on the left, it is the next building on the left, shortly after the road turns to the east. A small band of bandits have made it their home and attack any passing travelers. There are numerous snowberry bushes and various colors of mountain flowers along the road and around the shack, and also several bear traps hidden among the vegetation around the building. The shack has no windows or doors, large holes in the ceiling and walls and no stairs leading up to the top floor. 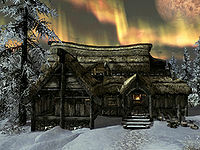 A hundred paces further along the path is the path that leads up to the Sacellum of Boethiah, where the followers of Boethiah worship. The front of the shack has a typical decking area that is damaged like every other part of the building. To the right is a wood chopping block and a pile of firewood. Inside are four bandits including a boss-leveled chief. There is a fireplace in the middle of the northeast wall, with a long wooden table to the right, against the same wall. On the table is a leg of goat, a carrot, a cabbage in a cast iron pot and a random dagger. In the southern corner is a tanning rack beside a stack of crates. In the center of the shack are two long wooden tables set end-to-end with three wooden benches. On the tables is a salmon steak, two mammoth steaks and a portion of grilled leeks. There is a wardrobe against the wall towards the front of the building, while to the right, behind a partition wall is a pickaxe on the floor. Opposite the wardrobe against the northwest wall is a cupboard with a random light armor cuirass and a copy of the Block skill book A Dance in Fire, v2 on a shelf. 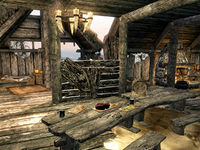 At the northwestern end of the room, against the southwest wall is a long wooden table with a random empty soul gem and a random stamina potion on top. To the right, in the western corner is a random shield. In the northern corner are two hay piles for sleeping and a crate with a food sack on top. To the northeast is a bedroom area used by the chief containing an unowned double bed in the corner with a dresser at the foot of the bed holding a couple of pieces of cheese. Beside this is a chair. While in the southern corner of this area is a novice-locked chest with a random pair of boots beside it along with another food sack. There are several barrels around the room some contain food and others ingredients. It is possible to access the top floor via some rocks helpfully piled up against the rear of the shack. Once you are on the main roof you need to jump to the wing over the chief bedroom area in order to climb to the peak of the roof, from there you can jump back to the main roof at a far higher level enabling you to drop in through a hole in the roof over the top floor at the southeastern end of the building. The top floor has two unowned single beds, one on each side. On the floor near the foot of the bed against the southwest wall is a random healing potion, while by the foot of the other bed is a random helmet on a crate with a random weapon leaning against it. The floor is missing at the northwestern end of the room, with a master-locked boss-level chest and a chair by the edge of the floor. The hole enables you to drop down once you've finished upstairs. A chest with a novice-level lock on the main floor inside the house contains Treasure Map VII. This page was last modified on 12 April 2017, at 06:40.